Tourists spent £21bn in 2013, while this year's total is forecast to be about £21.3bn. There has also been a surge in the number of Chinese tourists and the amount they are spending. They spent £492m in 2013, up from £184m in 2010. Over that period, the number of visits from Chinese people rose by 79.1% to 196,000. Overall, the number of visits by people from overseas is expected to increase next year, with 35.1 million trips expected - up 2.5% on this year and compared with 29.8 million in 2010. In 2010, the total spend from overseas visitors was £16.8bn. Tourism has grown at a faster rate than other industries since the end of the recession and is one of the UK's main export earners. In June, VisitEngland highlighted a gap between the growth in visits to London, which it said were up 14% since 2008 - and those to the rest of England, down 4%. But Tourism Minister Helen Grant said that as well as major London attractions, tourists were keen to see Premier League football matches, Bicester village in Oxfordshire and Stratford-upon-Avon. She told the BBC: "Americans continue to visit, they spend most money and they've been attracted by [television] programmes like Downton Abbey and Sherlock Holmes." The UK is also encouraging more visitors from Mexico to visit Britain in 2015 - which the countries' governments have designated the Year of Mexico in the UK and the Year of the UK in Mexico - as both look to showcase their best culture, arts and creative industries. The number of visits by Mexicans climbed from 67,000 in 2010 to 108,000 in 2013. Americans part with more money than any other nationality, spending £2.5bn in 2013, up 19.4% on 2010. Spending by visitors from France (up 18% to £1.35bn) and Germany (up 18% to £1.4bn) also grew strongly in the four years to 2013. The French visit Britain the most, with 3.9 million visits in 2013 while Germany is second, with 3.1 million visits in 2013. GREAT - Britain's biggest ever tourism campaign - was launched in 2011 to promote Britain abroad ahead of the London 2012 Olympics. Its aim was to attract 4.6 million more visitors, £2.3bn in additional visitor-spend, and £1bn of extra investment over the next four years. VisitBritain chief executive Sally Balcombe said tourism would continue to be one of the country's major export earners. "One of our priorities for 2015 will be to inspire international visits to the nations and regions and showcase Britain's magnificent countryside," she added. "Our GREAT campaign continues to produce results and generated at least £1.8bn from inbound visitors in its first three years, creating economic value and jobs across Britain's tourism businesses." 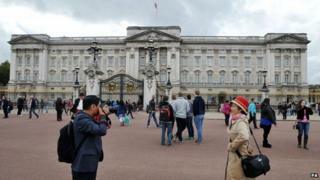 London 2012: Will GB reap ‘great’ tourism rewards?